With fall right around the corner it’s time to start thinking about fall-themed wedding cakes. Today’s featured cake is all about rustic themes and fall-inspired looks! 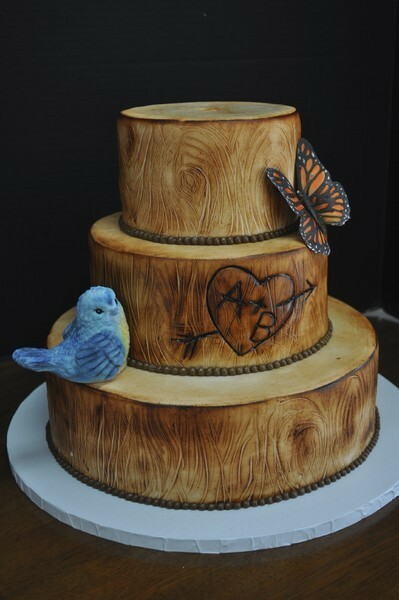 The very rustic cake looks just like a weathered tree stump and it’s perfect for your fall wedding! The cake it stunning in its realistic design and even features a “carving” of the happy couple’s initials. I love the addition of a butterfly and a bluebird to the cake. Of course you could always add other items from nature including fall flowers. The showstopper here is the cake and even without anything else, it’s stunning. You’ll find this cake here. It was created by Cute Cakes.